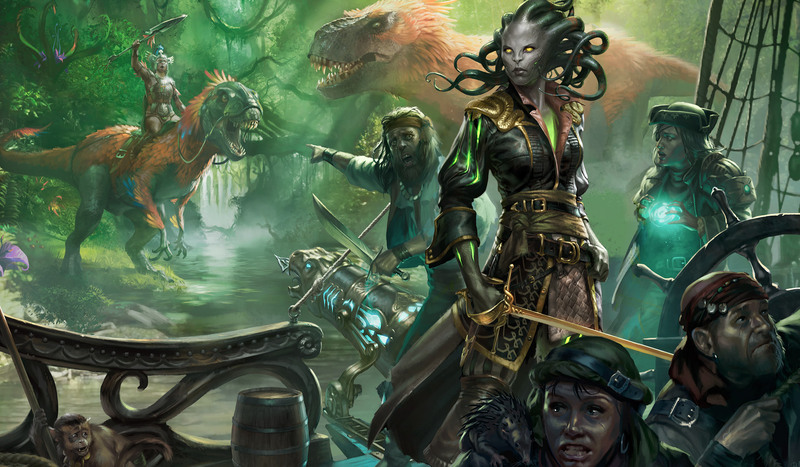 Join us for the release of Magic the Gathering’s newest expansion, Ixalan, and celebrate with all day drafts starting this Friday, Sept 29 and running on demand through Saturday evening. Drafts begin at noon on Friday, and run through FNM. All participants also get a Draft Weekend promo, and priority access to Friday Night Magic seating (release FNM is usually very busy, so signup early and skip the line). Drafts are $15 and prizes are 1 pack per match won. We will also have Ixalan product for sale on Friday, but watch out! Some of these dino-sized deals are just for release weekend only. Don’t forget that the Buy-A-Box promo booster pack contains 5-7 rares, guaranteed, and is available with any booster box purchase. Deckbuilder Combo $144.99 (Ixalan Booster Box, $40 singles gift card, buy a box promo, release day and pre-order only). See you Friday and happy gaming!